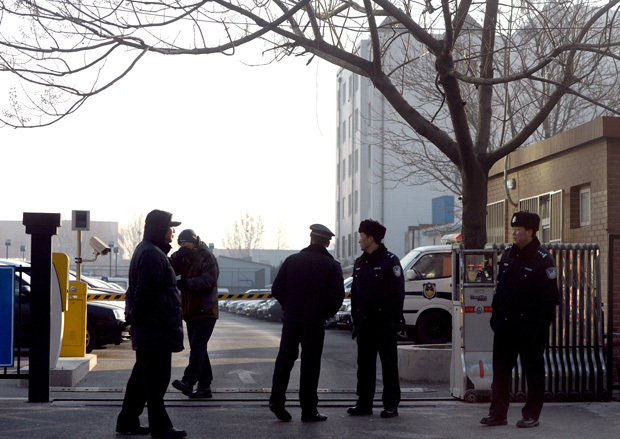 Police stand guard on January 22, 2014, outside the Beijing No. 1 Intermediate People’s Court, where Xu Zhiyong, one of China’s most prominent dissidents, was tried for his part in anti-corruption protests. This translation first appeared at China Change. Common to all those who identify themselves as citizens are the shared notions of constitutional democracy, of freedom, of equality and justice, of love, and faith. Because taken as a whole, civic groups are not the same as an organization as defined in the authoritarian sense, having neither leader nor hierarchy, orders or obedience, discipline or punishment, and in contrast are based fully on the voluntary coming together of free citizens. It’s through acts of pushing for system reforms that geographically dispersed groups of citizens are able to grow spontaneously into their own, and by acting to hold authorities accountable and pushing for political reforms, establishment of democratic rule of law, and advances in society, that civil groups are able to grow in a healthy way. Pushing for equal access to education, the right for children of migrant workers to sit for university entrance exams where they live, and calling on officials to disclose their assets—these are civic acts carried out in precisely this sense. When China established the household registration system, or hukou, in 1958, it created two separate worlds: one rural, one urban. In 1961, China established the system of custody and repatriation. From then on, anyone born in a rural area who wanted to find work and try a new life in the city could be arrested and forcibly returned home at any time. In Beijing in 2002 alone, 220,000 were detained and returned to their home towns. In 2003, the custody and “repatriation” system was abolished, but it remained a long road for new urban arrivals to integrate with the city. In 2006, we discovered through our research in Beijing that there still existed as many as nineteen discriminatory policies against non-local permanent residents, the most inhumane of them being the very policy that prevented children from living with their parents and receiving an education. I also witnessed the taping of a program on Phoenix TV where a little girl sobbed because she could not bear to leave her mother and father in Beijing where she grew up to go back to a strange place where her hukou is to go to school. In a hutong in Di’anmen (地安门), I witnessed Zhang Xudong (章旭东), a top eighth grader at Guozijian Secondary School, who was forced to go to a completely strange county high school in Zhangjiakou after graduating from middle school to continue his education just because he did not have Beijing hukou. Ill-adjusted in language, environment and textbooks, a year later he dropped out. He became withdrawn, not the happy boy he once was anymore. His parents have worked for nearly thirty years in Beijing but they are forever outsiders and second-class citizens in this city. When I think of the hundreds of millions of children whose fates were permanently decided by the hukou segregation, of generation after generation of Chinese people who have been hurt by this evil system, of the countless Chinese who died in the custody and repatriation system, today I stand here as a defendant, filled with no grudges but pride for having worked to eliminate the segregation system with Chinese characteristics, and for having fought for millions of children to be able to live with their parents and go to school. In 2008 when the Sanlu milk powder scandal broke, we brought together a team of lawyers and calculated the number of victims based on media reports. We proposed fair compensation schemes in accordance with the law, while working with the victims to successfully push the issuance of a government-led settlement plan. However, the government compensation package was far from from adequate for the damages suffered by many children. For instance, the cost of an operation for one child was nearly 100,000 yuan (US$16,500), and the compensation he received was only 30,000 yuan ($5,000). So we continued to seek redress for the more than 400 children we had represented, bringing lawsuits all the way to the Supreme People’s Court, to more than a hundred courts across China, and to a court in Hong Kong. In July, 2009, when I was thrown in jail for the so-called “Gong Meng tax evasion” and when people from all walks of life made donations to help pay the fine imposed on Gong Meng, our volunteers in the south were sending a settlement of one million yuan ($165,000) to the home of a baby victim. Petitioning is rights defense with Chinese characteristics. In a society like ours, comprised of relationships that belie privilege, corruption and injustice, to step forward in defense of one’s rights and dignity is something only the most stubborn of us dare do. But this small minority, when gathered in the nation’s capital, number in the tens of thousands. They get driven out of Beijing, or illegally detained, or beaten. In Beijing alone, there are more than forty black jails—and we’ve verified the numbers—that have been used to illegally detained people. When we visited these black jails and reported the crime taking place, showing the specific laws it violated, we were humiliated and beaten by those guarding them. Time and time again, I feel proud for sharing a little bit of their suffering. The People’s livelihood is emphasized year after year, yet hundreds of millions of people still live below the internationally defined poverty line. In remote and mountainous areas, corrupt officials even embezzle the subsistence allowances of only 100 yuan ($16.50) a month for the extremely poor. The wealth gap between the elites and the general public is ever-widening.